The effects of peppermint tea are generally lighter and gentler than peppermint oil capsules. 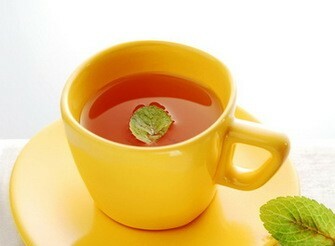 The tea is very refreshing, doesn’t need to be sweetened and has a real ‘pick me up’ effect whenever you drink it. More importantly, peppermint tea can be very beneficial for your digestive system and help alleviate problems like bloating, stomach gas and flatulence. Peppermint has relaxant and antispasmodic properties and can help relieve cramps and spasms in the gastrointestinal tract, bile duct and gallbladder. This improves the passage of both food and swallowed air through the digestive tract, allowing them to go through smoothly and without pain or discomfort. The volatile oils in peppermint also stimulate the gallbladder to release bile that your body uses to digest fats. The flow of bile to the liver can also be increased by the compounds in peppermint tea and moderate intake of the herb seems to have a detoxifying effect on it. A well functioning liver is vital to overall digestive health and therefore reducing flatulence problems. While you normally shouldn’t have too much liquid with meals, peppermint tea is one drink it really would be beneficial to sip a small cup of, just before or even during a meal, for its positive actions on your digestive systems. Personally, I find a cup of peppermint tea around fifteen minutes before food really seems to help prevent problems later on, particularly if I’m having a large or a little less than healthy meal. What is the Best Peppermint Tea for Bloating and Digestive Problems? When looking for a good peppermint tea you want to find one with the peppermint leaf cut thickly, so as to avoid losing too many of the important oils in processing. Ideally, the peppermint should be grown organically and available in unbleached teabags for the healthiest option. Searching for the best peppermint tea I kept coming across recommendations for Heather’s. Their peppermint tea is specifically grown for a high volatile oil content and is considered medicinal strength. As well as bloating and occasional stomach cramps it is even praised as effective for people with IBS and other serious digestion problems. While these high strength peppermint tea bags are easy to use and take to work, for an even stronger tea you can also use loose leaf organic peppermint in a teapot or French press, steeped in very hot, but not boiling, water for a few minutes. There’s much more on how to make a great cup of peppermint tea for relieving digestion problems like bloating and intestinal cramps here. Peppermint has an effect on digestion and other physiological processes. For most people this effect is positive, but, as with any herbal supplement, it makes sense to be aware of the influence its introduction is having on your health and general wellbeing. Peppermint tea taken around the same time as certain medications may interfere with their absorption, so be conscious of this and consult a knowledgeable health-care professional if in doubt. It may also interfere with iron absorption if taken at the same time as iron containing foods or supplements. If you are worried about not getting enough iron in your diet it may be a good idea to use either the tea or peppermint oil capsules before a meal rather than with it. Strong peppermint tea or oil is not generally recommended for pregnant women, very young children or people with heart disease, ulcers or problems with reflux and heartburn. Again talk to your doctor if in doubt. There have been a few studies, mainly on rats, that suggest drinking large amounts of peppermint tea may lower testosterone levels. It seems the amounts would need to be relatively excessive, but it still makes good sense for men concerned about this to enjoy the tea in moderation. How Many Cups of Peppermint Tea a Day? A cup or two a day is probably enough to get the digestive benefits of peppermint tea without going overboard. As with most herbs and supplements, be aware of how they are making you feel, particularly around an hour or two after taking them. It’s also a good idea to take a week off any herb or supplement from time to time. The beneficial effects of peppermint tea are enjoyed by millions of people around the world. It makes a great tasting, caffeine-free pick me up that can effectively aid digestion, help relieve stomach gas and bloating and prevent flatulence. Have you tried medicinal strength peppermint tea for bloating and stomach cramps before? I’d be interested to hear how it worked for you personally. If you’ve never tried it I’d really recommend giving it a go, not just for the health benefits, but for the refreshing taste as well.